SCOTLAND. Mary Stuart. 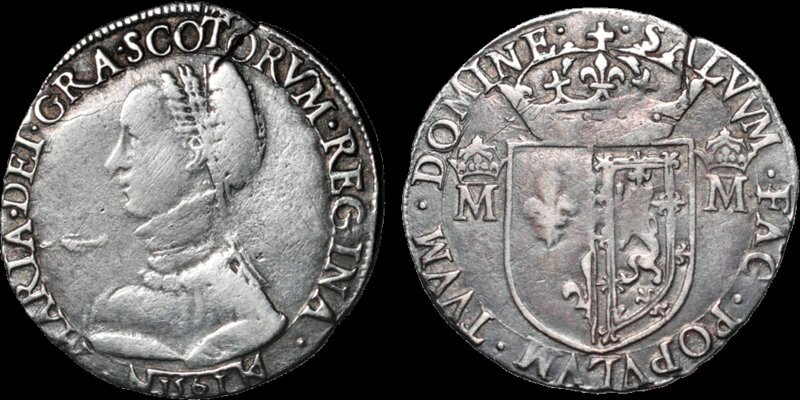 1542-1567. AR testoon. 5.72 gm. 28 mm. Third period, 1560-1565. First widowhood. 1561. Her bust left in contemporary costume; MARIA DEI GRA SCOTORVM REGINA around, 1561 in tablet below / Crowned arms of France and Scotland, crowned M to either side; SALVVM FAC POPVLVM TVVM DOMINE. S. 5422. SCBI 35 1111-1112. Near Very Fine; striking crack on edge at 1'; attractive even old toning; a bit off center, minor marks and scratches; a die break characteristic of one of the dies* is visible in the field left of the portrait. A pleasing example of this rarely offered piece with its finely rendered portrait. Ex Davissons Auction 22 (28 April 2005) lot 268. *I am unaware of a study of the dies used to issue this coin, but SCBI 58 illustrates 12 examples of the issue and the photos show several different varieties.